In today's world, life does seem to hurt more. Our afflictions seem numerous and overpowering; peace of mind and a connection with our spiritual selves seem to elude us. But, as Brian Stiller tells us in this compassionate guide about hope and healing, to continue in emotional pain is not the intention of creation. WHEN LIFE HURTS is dedicated to helping people who are in pain or crisis. 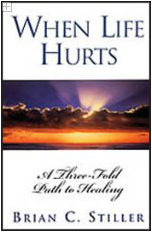 Neither denying pain's existence nor finding easy solutions, Dr. Stiller shares the Three-Fold Path to Healing--Hope, Faith and Love--the keys to healing inner hurts. The emotional journey of WHEN LIFE HURTS will nourish our souls, releasing us from despair and revealing the path to living happy and spiritually content lives. What Is A Three-Fold Path To Healing? If God Knows, Why The Hurt?